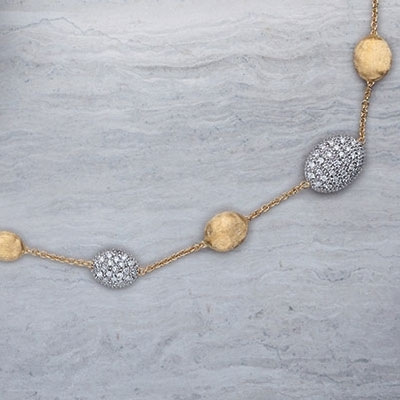 Marco Bicego jewellery has not always been in the hands of Marco, designing with the creative and modern woman in mind by combining a contemporary elegance with a vintage twist. However, it has always had incredible and unique values flourishing from its heritage. 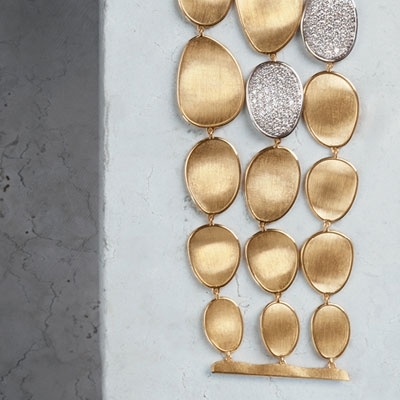 Founded in 1958 by Marco’s father, the eponymous brand Marco Bicego continues the old-world Italian craftmanship with exclusive manufacturing techniques. Namely, the hand-twisted coil and hand engraving using a Bulino tool, which engraves hundreds of tiny lines on the surface of the gold, making for a quality finish that is admired by many but imitated by few. The authenticity of each piece can be fully appreciated thanks to the hand-crafting of the semi-precious stones in workshops in Vicenza, Italy. 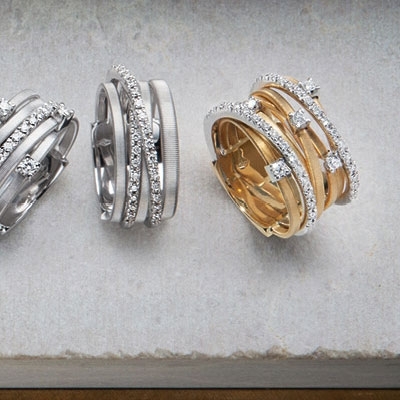 As seen in some of the collections we stock here at Banks Lyon Jewellers, like the Africa and Jaipur, the feminine and distinctive designs draw inspiration from locations around the world with a past, and a present, that features a strong female presence decorated by exquisite jewellery. 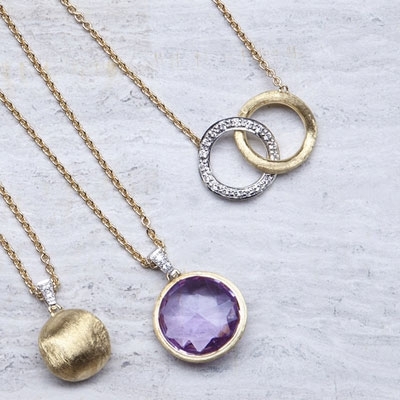 Each unique piece of Marco Bicego jewellery is intricately designed as luxury pieces that are suitable for everyday wear, since they should be showcased and celebrated, not boxed waiting only for a special occasion. 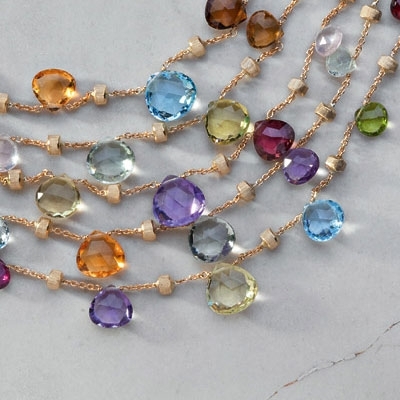 The natural gemstones used attain their identity through a collaboration of Italian culture and creativity, helped in their mission to express the individual personality of each through their exclusive, generally asymmetrical cuts and delicate hues dancing in the light they catch. The exotic aesthetics combine a relaxed yet sophisticated styling, bringing a fresh twist on a vintage design. 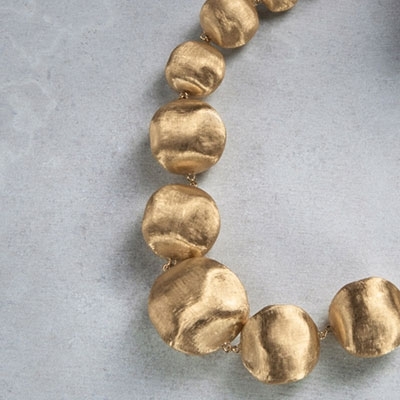 Each piece of Marco Bicego jewellery has been carefully crafted to suit every woman, whether a pair of simple, understated Marco Bicego earrings to complement a plain white t-shirt, or a centrepiece necklace to complete the cocktail dress. The beauty of such creations is their flawless ability to be layered with one another. Hilary Clinton and Kate Winslet are amongst the many strong, empowering women seen wearing the brand and carrying the values, just like you can. 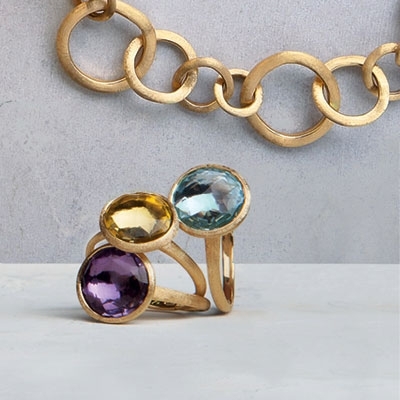 Buy Marco Bicego Jewellery on finance, with 0% available on all pieces above £500 with deposits starting from as little as 10%, you can spread the cost over a number of months to best suit you. You can also buy at your convenience in one of our Lancaster or Kendal showrooms or online. If you require any further help, please get in touch with our devoted team today. Pop into one of our Lancaster or Kendal showrooms or make use of our online chat. We are also available for assistance by phoning 01524 381020 or emailing personalshopper@bankylyon.co.uk.